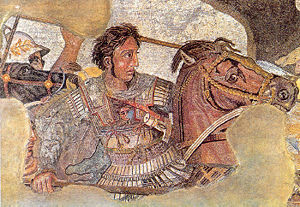 Alexander the Great (Greek: Αλέξανδρος ο Μέγας or Μέγας Αλεξανδρος, Megas Alexandros; July 20, 356 BC – June 10, 323 BC), also known as Alexander III of Macedon, was the basileus of Macedon (336 – 323 BC). His reputation has come down to us as one of the most successful military commanders in history, although current reexaminations of sources are raising some doubts about his invincibility. By the time of his death, he had conquered most of the world known to the ancient Greeks. Alexander assumed the kingship of Macedon following the death of his father Philip II of Macedon. Philip had united most of the city-states of mainland Greece under Macedonian rule (the so-called League of Corinth). After reconfirming Macedonian hegemony by quashing a rebellion of southern Greek city-states which included the sack of Thebes, and staged a short but bloody excursion against Macedon’s northern neighbors, Alexander set out east against the Achaemenid Persian Empire, which he defeated and overthrew. His conquests included Anatolia, Syria, Phoenicia, Judea, Gaza (which he sacked), Egypt, Bactria, and Mesopotamia, and the extension of the boundaries of his own empire as far as Punjab, India. He failed to conquer the Scythians, and his conquests in India did not survive his departure. Alexander’s original vision of empire had been to the east, though, to the ends of the world and the Great Outer Sea, as described by his boyhood tutor Aristotle. Aristotle’s errors in geography (compounding those of Herodotus) may have led to the abandonment of Alexander’s schemes of eastward conquest. I am neither an Alexander apologist nor an Alexander revisionist. I have read all of the contemporary documents related to Alexander, some in their original language (Classical Greek) and I find it difficult to imagine Alexander as a hero, unless one’s definition of hero is very broad indeed. He had boundless energy and a fine war machine, but I suspect that his father was the better general and that without Parmenion, Alexander would never have gotten across the Granicus alive. I recommend Peter Green’s biography and especially his inquest on the Battle of the Granicus as an example of Alexander’s fallibility.1 It is an important concept, as many of my characters show the same contempt for Alexander that US military officers voiced (in private) for Donald Rumsfeld throughout the first decade of the twenty-first century.